Situated in the exclusive Montana Roja, the villa has magnificent views to sea and Fuerteventura, is a mere 15 minutes walk to the beautiful, sandy beach at Playa Flamingo, or 15 minute walk into the town centre with its wonderful shops, cafes and restaurants. Magnificently equipped with everything possibly provided to maximise the enjoyment of your holiday. The villa has 3 bedrooms, 2 bathrooms, fully fitted modern kitchen, spacious lounge with UK Satellite TV with all UK channels including BBC, ITV, Channel 4 and Channel 5,WI FI internet, video, DVD, Hi-Fi, and patio doors from lounge leading to a heated pool with Roman steps for easy access, sunbathing terraces, sunbeds, umbrellas and patio furniture. The gardens are beautifully planted with mature palm trees with surrounding wall to ensure your privacy. Hard working hoping life can get better. I live in England with my wife, 2 children and our 5 year old pet dog. My wife and I both work, but spend most of our holidays in lanzarote, where we have made many friends and have really fallen in love with the sun shine and country. Hoped to move out off the UK but family happened and had to put plans on hold. We love Playa Blanca because of the fantastic facilities in the area. There are some beautiful beaches,diving from the beach or boat and the marina boasts a great range of bars and restaurants. There really is something for everyone here. The area is easily accessible with the airport less than an half hours drive away. A Fantastic Private villa with its own pool.The property is just 15 -20 minutes walk from the fabulous beaches, bars and restaurants. There really is something for everyone here. The area is easily accessible with the airport less than an half hours drive away. Villa Lazy Days lounge offers you UK Satellite TV with all UK channels including BBC, ITV, Channel 4 and Channel 5, WI FI internet, video DVD, Hi-Fi Patio doors from lounge leading to a heated pool, a place to relax away from the sun in simple comfort. I do have some stuff for the kids for in the pool. 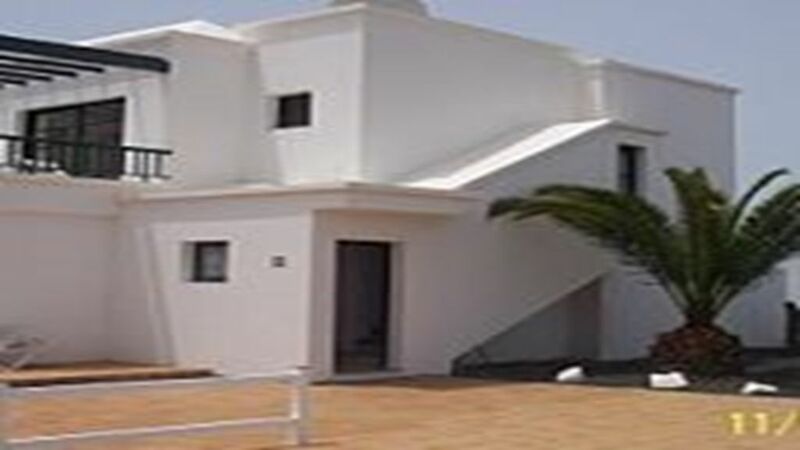 Nearest golf course is at Costa Teguise, approximately 45 mins drive. Although plans are set for a course in Playa Blanca. Notes on accommodation: A cot, high chair, extra bedding and duvet are available. Changeover day is usually on a Thursday but this is flexible. Check in time is 2pm and check out 10am. Outside: The private heated pool measures approx 8 x 4m x 1.3m - 1.8m deep. The terrace boasts sunbeds, chairs and table. There is plenty of room for sunbathing and the property is totally enclosed by a volcanic rock wall. It is the perfect place to relax, share a glass of sangria or wine with a friend and watch the hot Mediterranean nights sun go down. Utility Room: A seperate area for all the washing with a washing machine and washing line. Cleaning / Towels / Linen / Maid service: All bedlinen and bathroom towels are provided - but please bring your own beach/swimming towels. The villa is cleaned to a high standard before your arrival, if you are staying for 2 weeks there is a mid term clean. Bedlinen/towels are changed weekly. This was a lovely spacious and clean villa in an ideal location with a small residential complex. Only 10-15 walk from village centre. Small supermarket 2 min walk. there most days. We had a hired car which we could park inside the locked gates. Would definitely recommend this villa to families and groups. Thank you Jillian, your welcome to stay any time. This is a pleasant villa in a wonderful resort that we have visited many times. It is extremely good value for money without in any way being substandard. the furnishings are sensible and functional and the villa has the benefit of a reasonable selection of television stations and extremely good WiFi connections. The pool and patio area are well maintained and generous. They benefit from having sunshine all of the day, something that cannot be said for everywhere in Playa Blanca. Access to the town is an easy walk, in or out. A taxi costs roughly 3 euros. However, if you want to stay in there are ample facilities for home cooking. We had a wonderfully relaxing time in the sunshine in late October. Lazydays is well named. As the title says Very Nice , we had a great stay at villa Lazy Days . The nearest beach is Playa Flamingo. It is 10 - 15 minutes stroll where you will be greeted by its wonderful shops, cafes and restaurants. Playa Flamingo beach is completely sheltered and an ideal place for the children to play whilst adults relax. Playa Blanca boasts a small beach and beyond that, the fabulous secluded beaches of Papagayo. Arrecife airport is 35 - 40 minutes drive away. Playa Blanca is approx 15 mins slow stroll or 3 mins by car. The harbour which has regular ferries to Fuerteventura and also boat trips. A diving school close by, markets held 2 x weekly. The new Rubicon marina has a good selection of upmarket shops and restaurants. The old favourite walk up Montana Roja - an old volcano of which the quaint exclusive Montana Roja is named after. Changeover Day: The arrival and departure days and times are flexible. Changeover day is usual on a Thursday but this is flexible. Check in time is 2pm and check out 10 am again we can be flexible.